For those of us who sell our handmade items online, good photographs can be what sets you apart from everyone else. 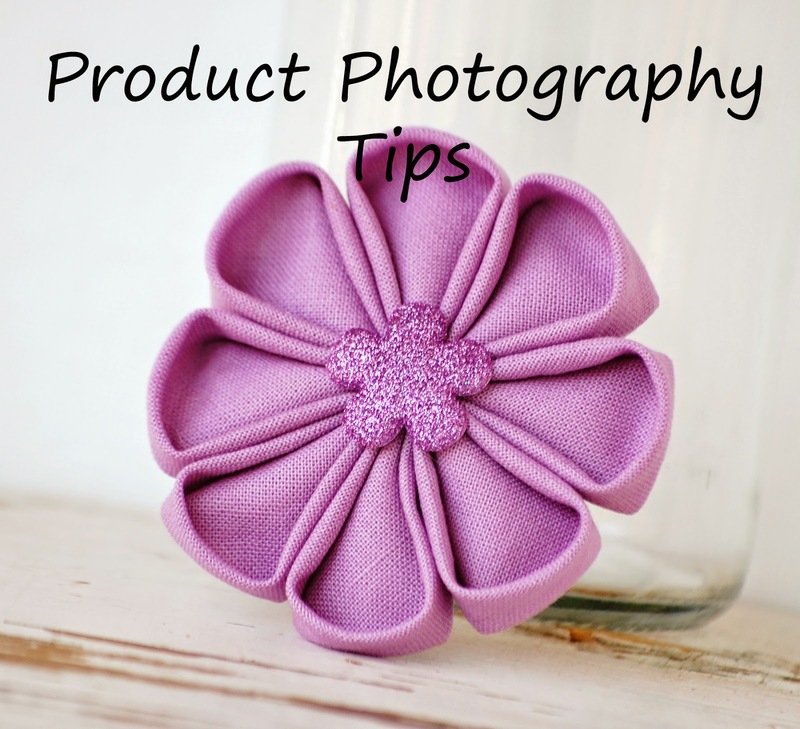 When photographing your finished item for product listings, there are a few key things to focus on. 1. Background Since my hair accessories are relatively small, I am able to use a single plank of distressed wood and a white canvas board as a backdrop. Just about any neutral background will work, but experiment with background colors and textures to figure out what looks best with your product. You will want to give your product space from the background so your product is the focus. If possible, give several inches to a foot of space (depending on the size of your object) between your product and the backdrop. I use a glass jar or a piece of wood as a spacer. 2. Lighting Lighting is the most important factor to getting a good photograph. Use natural (sun) lighting, avoiding direct sunlight. Camera-mounted flashes and direct sunlight give everything a washed-out look, and causes harsh shadows. Open shade is best as it gives a softer, more even look. I prefer to shoot in the mid afternoon when the sun is bright on our deck, but the sunlight is not directly coming in the window. Learn what settings you need to change to turn off the flash on your camera, and use a tripod to minimize camera shake with long exposures. Reflectors are key to even lighting. 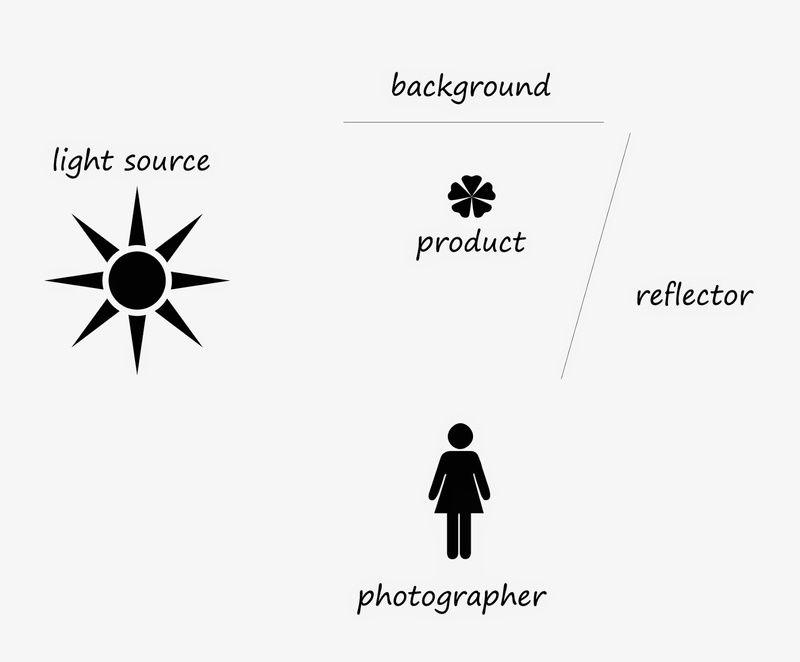 This graphic shows an easy setup with a single reflector opposite of your light source, but multiple reflectors may be necessary. Experiment with the angle and height of your reflector to erase any shadows and ensure you product is well-lit. 3. Composition When you have a single product, it should be the focus of your image. Your product should fill the frame nicely, keeping in mind if you will need to convert your image to a square for your product listing. Take lots of shots, and don't stand in one place. I will stand on a chair, then lay on the floor to capture different angles. My product is 3 dimensional, and a different angle can give a new perspective. Thank you Melanie from Violet's Buds for this week's post! What's HOT: Handmade in Kansas City!